Thousands of incredible entries were sifted through after the January 31st closing date, and early this week these were whittled down to five. The winner from these five was “Frendly”, created by Rowan from St Mary’s School, Brewood. 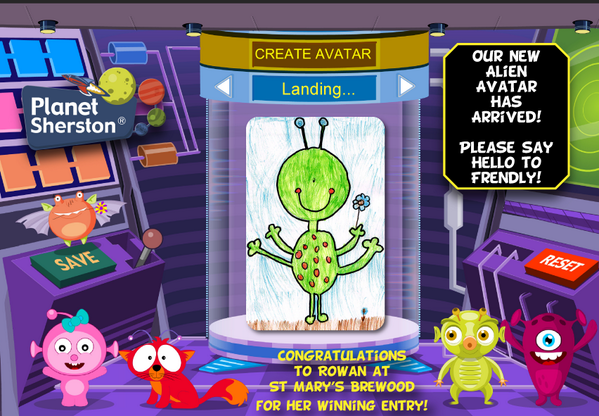 Her school will receive a subscription to Planet Sherston, the games-based learning world for primary school children. Better still, Rowan’s character will be available to any Planet Sherston user as an avatar option! Webanywhere has thoroughly enjoyed working alongside Planet Sherston and seeing the huge amount of event put in by primary schools across the UK. If you’d like to find out more about how Planet Sherston can inspire your children to work harder, and engage them in learning from an early age, get in touch here. Webanywhere has launched a prize draw to mark the launch of Jotter Learn and School Merits, two brand new e-learning products. Simply watch one of our webinars, or attend our launch event on 26th February, and your school could win a year’s subscription to Jotter Learn, School Merits and School Jotter, the Number 1 website system for primary schools. Find out more here.